Packed with rich, essential natural nutrients to nourish and moisturize hair, the Pureology Hydrate Superfood Treatment is a moisturizing hair mask for dry, color-treated hair that moisturizes and softens. 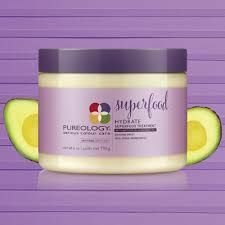 The Superfood recipe works to create a smooth, shiny and frizz-free look and feel. The Hydrate Superfood Treatment formula is made with essential nutrients such as Avocado Oil and Coconut Oil to nourish and moisturize dry hair while strengthening the surface of the hair. Created with color-treated hair in mind, the exclusive Antifade Complex® provides hair color protection. The aromatherapy blend of orange, citrus, pineapple and leafy green creates an invigorating experience. 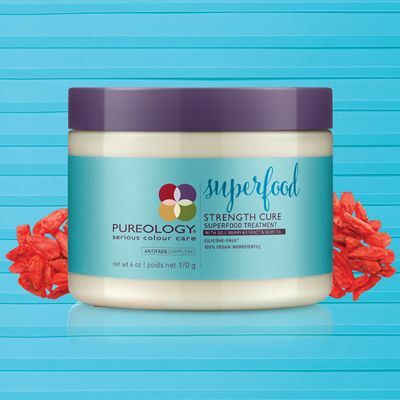 Protect and repair your damaged, color-treated hair with the Pureology Strength Cure Superfood Treatment. Packed with powerful superfoods and natural ingredients, this hair strengthening mask for damaged hair repairs and protects from future hair breakage. The Strength Cure Superfood Treatment formula is created with essential nutrients such as Goji Berry Extract and Olive Oil to protect hair from environmental damage while increasing smoothness and shine. Created with color-treated hair in mind, the exclusive Antifade Complex® provides hair color protection. The aromatherapy blend of bergamot, black currant, mandarin, rose and basil creates a luxurious experience.